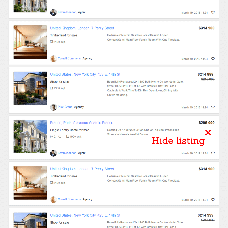 The Hide listings feature will help your site users hide listings from the search results page even when these listings match the selected criteria. It's like adding a listing to the blacklist if it does not meet one's requirements. This way it does not come up in the search results, ultimately saving a person's time. It will be possible to remove listings from the blacklist at any time.